Posted November 10th, 2016 by Ms. Jen & filed under news + events, photos + text from the road. Thurs. 11.10.16 – This is a very rocky week. Starting the day of the election, Scruffy’s back end and legs stopped working for him and by yesterday morning he was unable to walk or even raise up and stabilize his legs. We had already planned to visit Erika and Lukas today so that Lukas could play with Belle. Erika let Lukas know that Scruffy was at the end of his life and that Lukas would most likely not see him again. 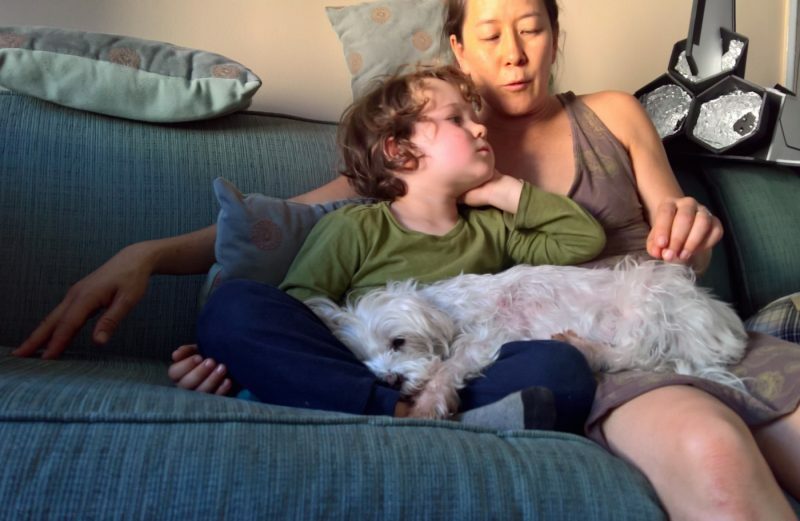 Near the end of the visit, Lukas wanted to sit on the couch with an ailing Scruffy in his lap. It was very sweet. In this photo, Erika was telling Lukas the story of the first time that Lukas met Scruffy.